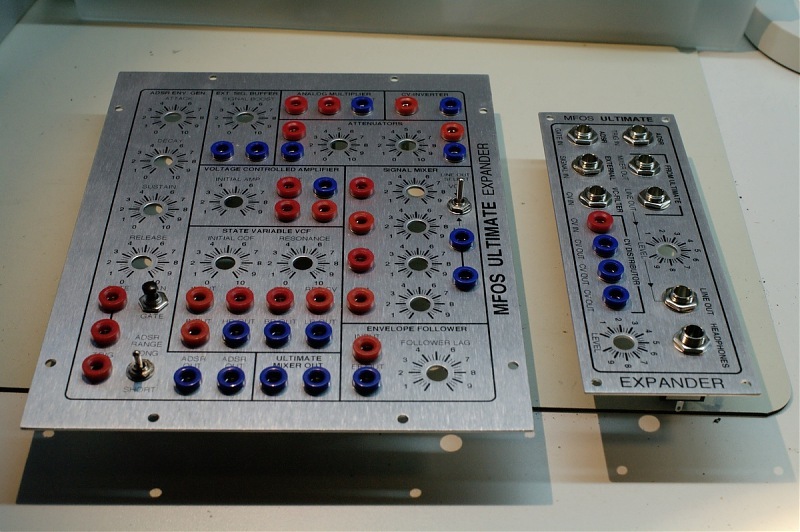 The MFOS Soundlab Ultimate and Ultimate Expander panels have been out of stock for a long time-- and we are happy to announce they will be back in stock shortly!! These are the original panel designs by Ray Wilson, produced by the same shop Ray used for his panel production. We're going to use this thread for build examples, notes, questions etc. 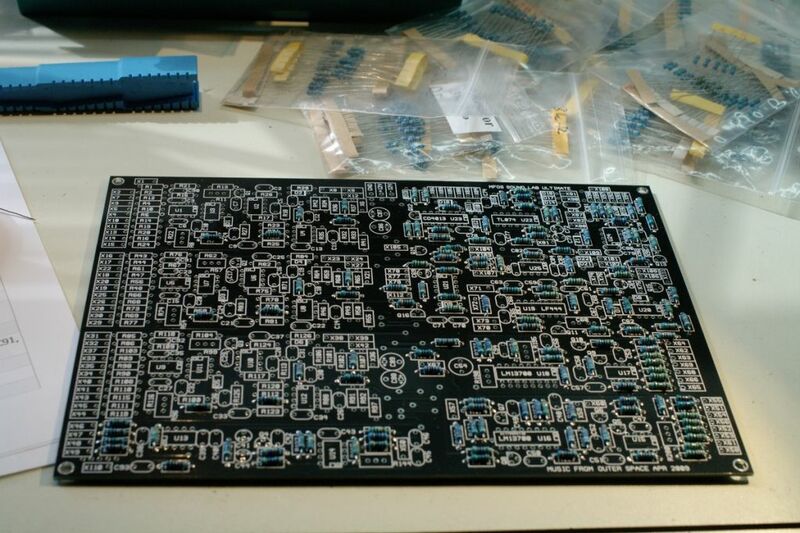 3)if awarded to you, in exchange for the panel/pcb set, you'll agree to document your build experience, comments, mods, pictures, etc in this thread. 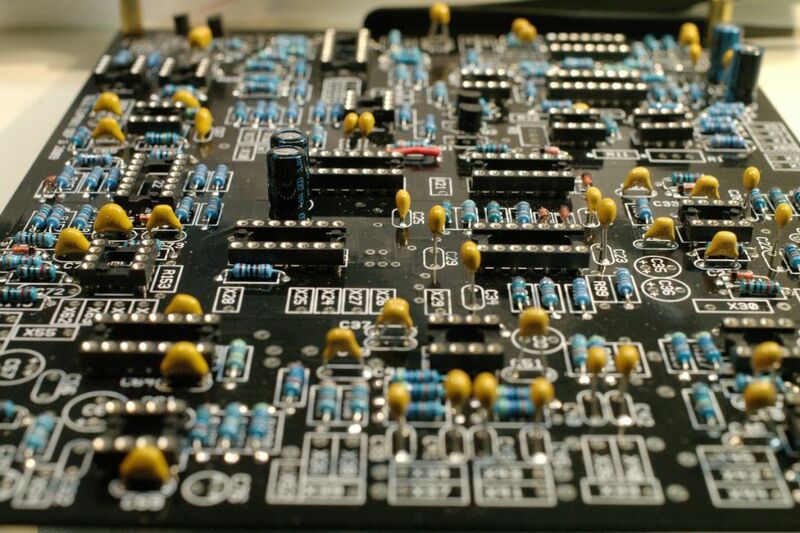 You're responsible for sourcing your own parts. 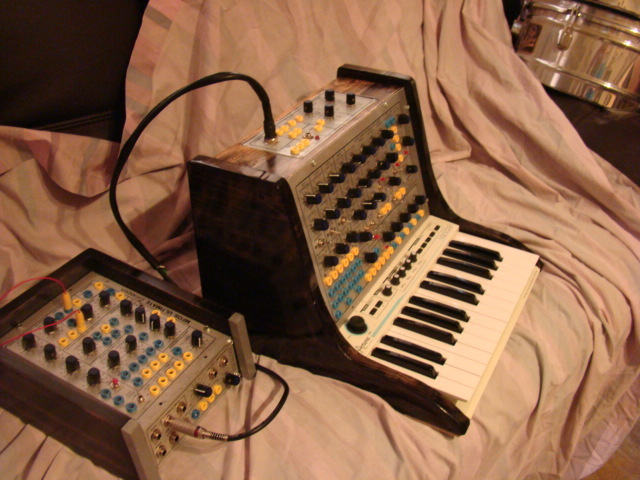 4) You have to be reasonably comfortable building a case for the completed synth-- Ray offered wood case plans, but any case would be OK. Be as creative as you like. We are very proud to be offering these panels again!! I do not have the 100 posts yet (which is all that is missing for me to be qualified yet...), but I sure do document my builds. 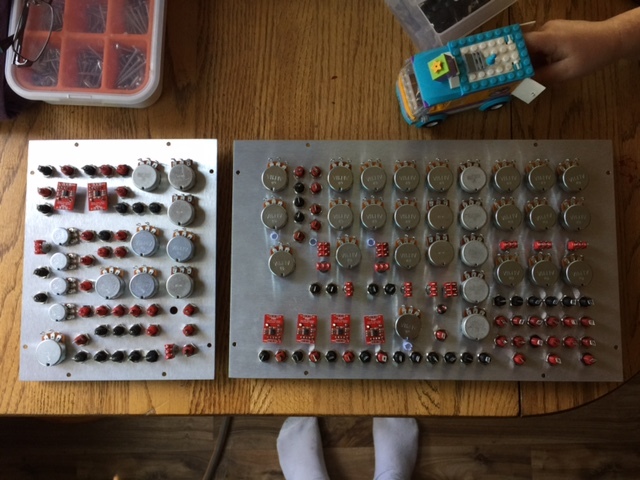 Here's a thorough documentation of my finished MFOS SL Mini Synth (the one on my avatar pic) and TTSH builds, plus work-in-progress of my Jasper, self-designed TTSH keyboard and other stuff. Disclaimer: Sorry, it's in German . Just picked up the packet from our local customs office. May the adventure begin . A million thanks to Synthcube for making this possible ! I didn't have very much time recently, but I herbey officially announce I have started building it . 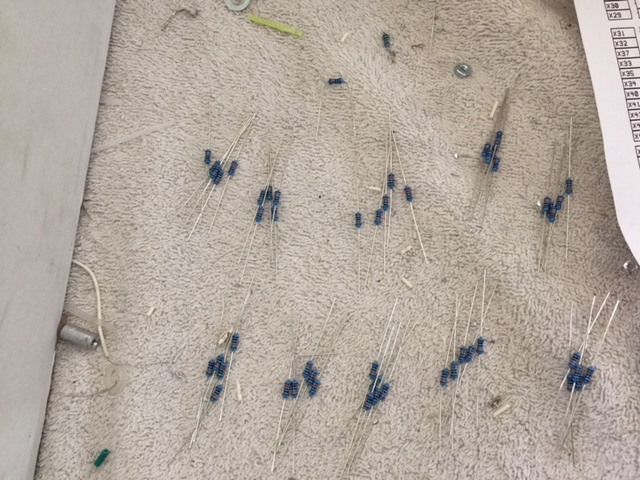 Only a few dozen resistors so far, but that's how we usually start . And I've given some thought about how to connect it with my other stuff: The MFOS Ultimate uses banana jacks, whereas my other stuff usually has 1/4 inch or 3.5 mm jacks. 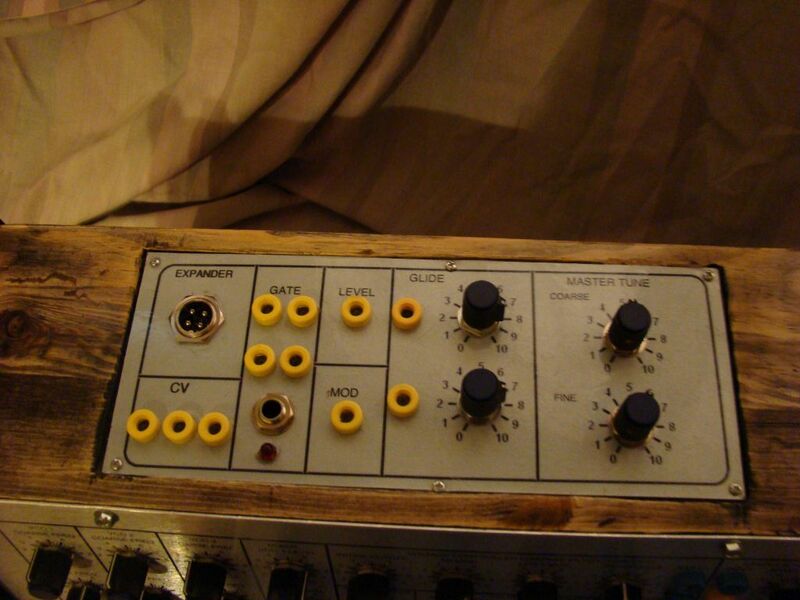 So I'll add an extra panel with just a few 3.5 or 1/4 inch to banana connections - basically like this, but integrated into the synth and not as an external box. Most resistors (except a few less common values which I need to order) are now on the PCBs, and so are all of the common (1N4148, that is) diodes, plus most of the capacitors and IC sockets (all but about a dozen or so DIL-8 sockets which should show up in the mail today or tomorrow). The 2N3904 and 2N3906 are also on the boards by now. More to come soon . 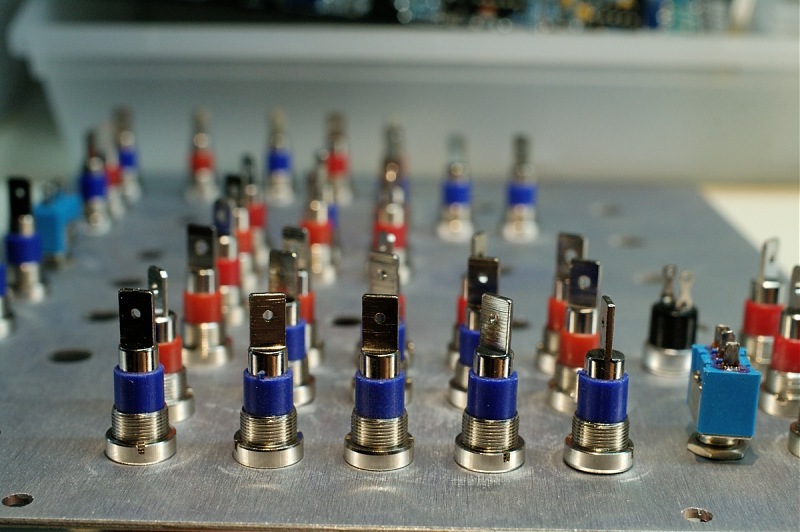 IC sockets (all but about a dozen or so DIL-8 sockets which should show up in the mail today or tomorrow). They arrived today, and I soldered them on the pcbs, as well as a few more caps. I think and hope I'll get the "use what you have at hand" part done this weekend, and then I will order the remaining parts I need. Added a few more caps, a couple of trim pots (what I had at hand) and the MPF102 today. Then I made legs for the SSM2210. Some (literally) decades old electrolytic caps served as leg donors . 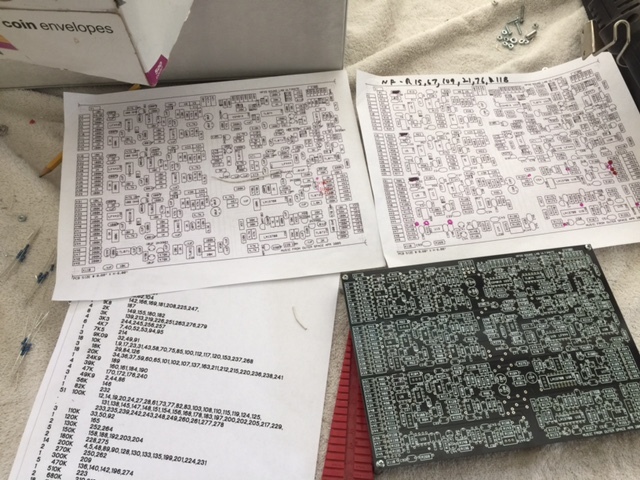 It'll probably be a while before I can really proceed: I'll order the remaining parts from Mouser soon, but it'll probably take about 4 or 5 weeks until I actually get them. In the meantime, I have a Jasper to finish and an ARP 1601 DIY clone to continue... and a self-designed custom keyboard for my TTSH to finish. I'll present it when it's up and running. This was lost when my house burned. 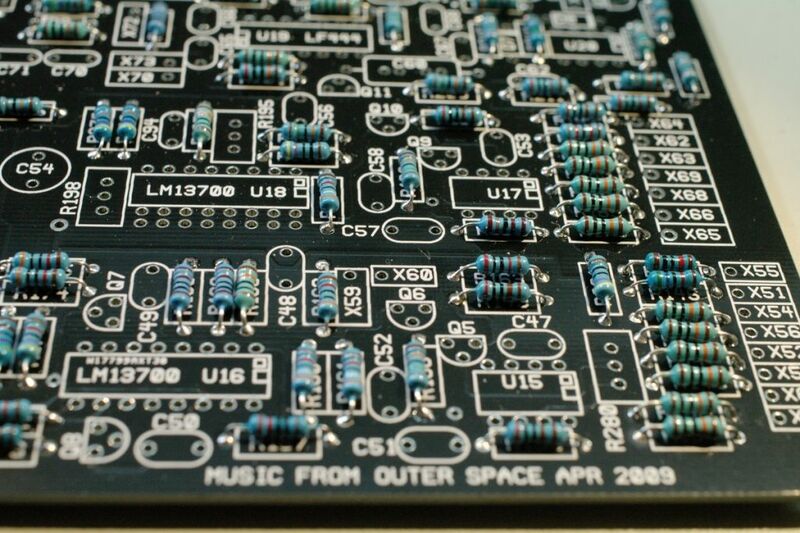 I have received my PCBs+ panels from Synthcube. I'm going to intersperse my build documentation in here with any others. I would like to point out that there are very good docs on the MFOS site and you should read through them. Also a word on parts. If you build this with craptacular resistors,caps,and trimmers from Tayda or someplace similar and it doesn't work where do you even start with the troubleshooting when you don't really trust your parts. 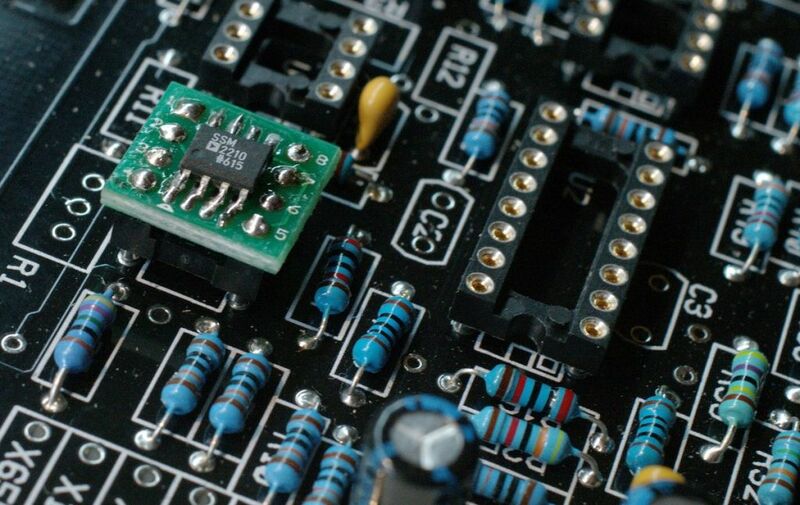 Use Mouser for most of your components and Synthcube will probably have the rest. My parts list will be a bit different that the one on MFOS. I build out of the stock I have on hand,ordering the bits I don't have. I only use metal film 1% resistors so I combined the carbon comp ones on the original BOM with the metal film and made a new list. I use more film caps than Ray did,I'll give a list of those. You can build it with the BOM on the MFOS site and have good results. I start with the resistors. Put a 1" standoff at each corner of the PCB to lift it off your work surface. No need for any kind of 'helping hand" or PCB vice. Print out the BOM and the PCB drawings,both the parts designators view and the parts value view. 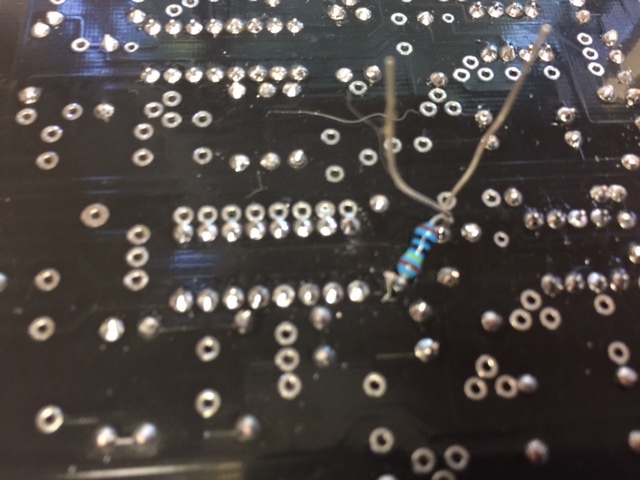 I suggest stuffing all the resistors before you solder anything. The reason for this is a bit of a failsafe. 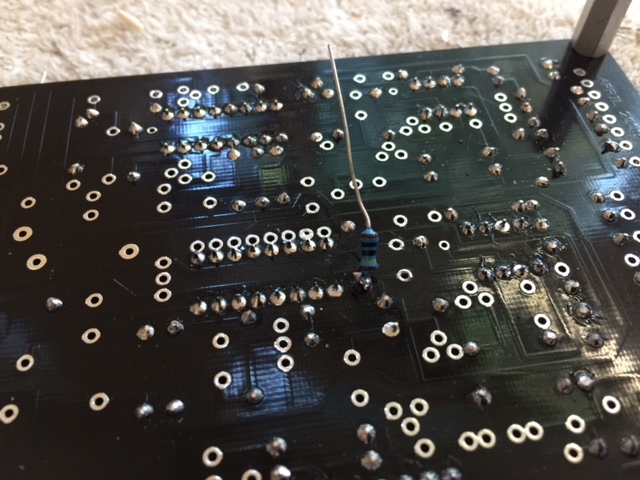 If you are installing your 100k resistors and you have one left that there is not a space for then you must have put a 10k or something in a spot that was supposed to hold a 100k. This only works with an accurate BOM,and careful counting of resistors before you bend the legs and install. Using a printout of the value view and a highlighter you can check each spot where a 100k is supposed to be and then mark it off on your cheat sheet.After you check each spot you will have found the mistake,or counting the highlighted marks you will see that you have 1 too many 100ks . I mark these off on the PCB with a sharpie. 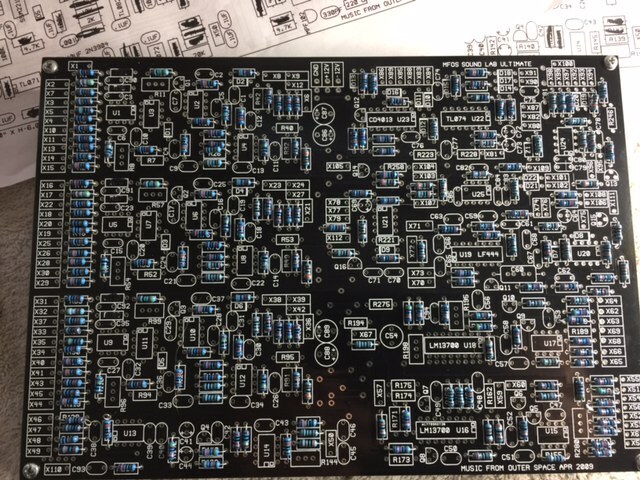 If you have a stock of parts just stuff what you can,and when you come to a value you don't have make a mark on the BOM for ordering.After the board is stuffed you can order all the missing bits at once and save some shipping. 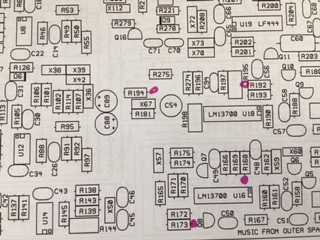 Don't forget to try to get any missing chips plus any panel components you need at the same time-jacks,switches,pots. If you are going to do mods or build an Expander look on the MFOS site for the attachment points and mark them on one of your cheat sheets so you can leave a place for the extra wires. I count them in groups of 5 for easy double checking. You really need an accurate count or you won't know if you have made an error. Just go down the BOM and stuff what you have on hand. Note what you need to order. 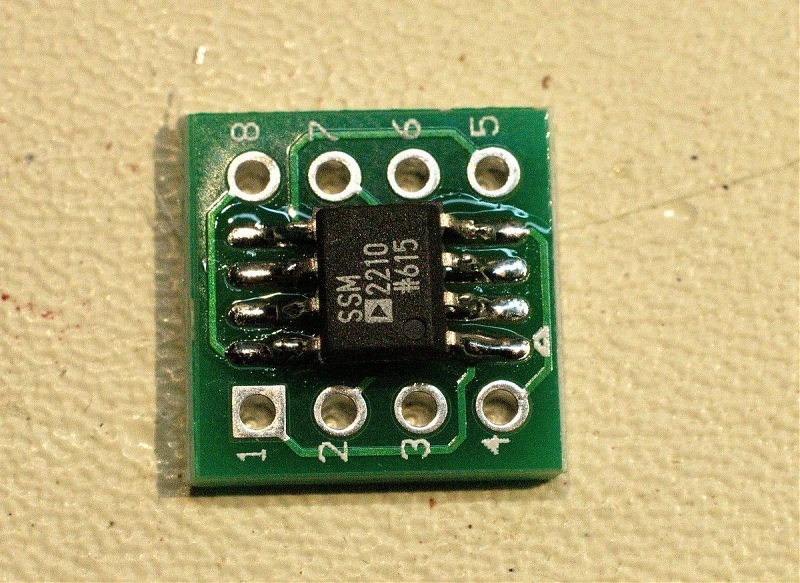 If you have only a few missing values go ahead and solder. #tojpeters, what are those resistor value changes for in the VCA? While looking over an ULTIMATE for a customer recently who felt that the VCA modulation was not performing as he would like I adjusted some of the values on the VCA which improved the operation IMHO. These changes are optional and as always if you are happy with the VCA modulation as it is, not necessary at all. I made these changes to my ULTIMATE and I like it better myself. With these changes you don't need to turn the initial level up as much in order for the AR and LFO modulation to effect the amplitude. 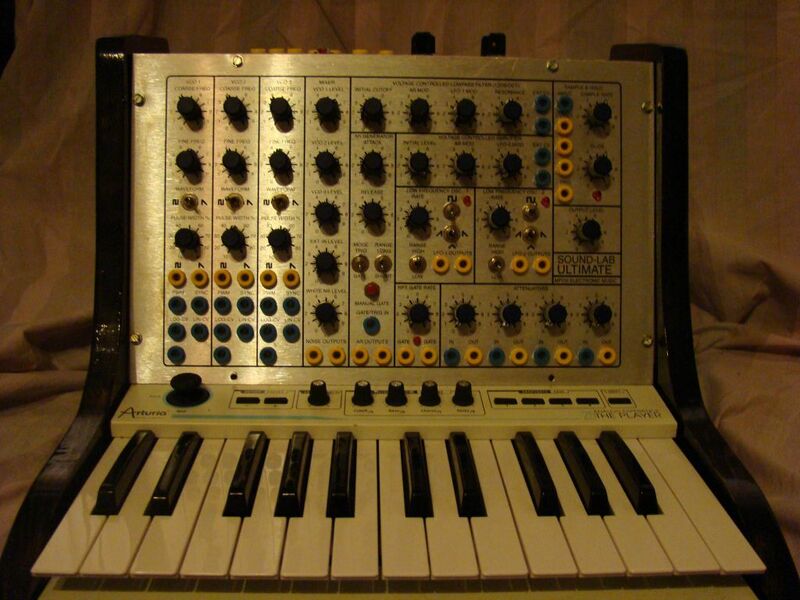 I also noticed that the LFO modulation is superceded by the AR modulation (which I also like). R176 changed from 82K to 47K. R184 changed from 100K to 36K. R189 changed from 100K to 24.9K. Added a 1M resistor from U18-A pin 1 to -12V. 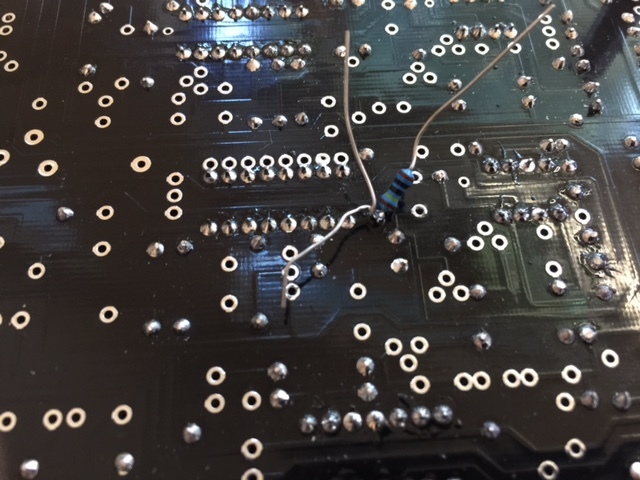 The last change (adding a 1M resistor from U18-A pin 1 to -12V) is not hard and I did it by soldering the 1M resistor between the leg of R190 (39K) which goes to U18 pin 1 and the -12V side of C58. Image of optional kludge. The parts list still reflects the old values since these are totally optional changes but I would suggest them for new builds. A builder (Peter Kvitek of Santa Clara, CA) let me know that after he had performed these mods he needed to change the CV Null trimmer from 2K to 10K. I left mine at 2K but if you have an issue with the CV Null you might give Peter's suggestion a go. After the resistors stuff your diodes. Pay attention to polarity. There is one zener diode. I do top side soldering. Flip the board And trim the resistor and diode legs. Inspect the solder joints as you clip. Touch up anything less than perfect. Before you start mark the leg of the 39k in the VCA section that gets the kludge and leave it long. This is another good place to use slave labor. Here is a drawing of the kludge. 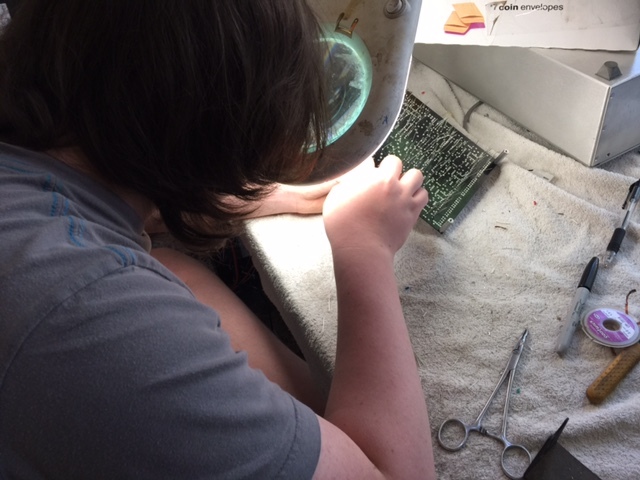 I also do topside soldering, much quicker! Next I do the chip sockets.Put them on the board and use bits of masking tape to hold them in place. Make sure you get the notch on the correct side. 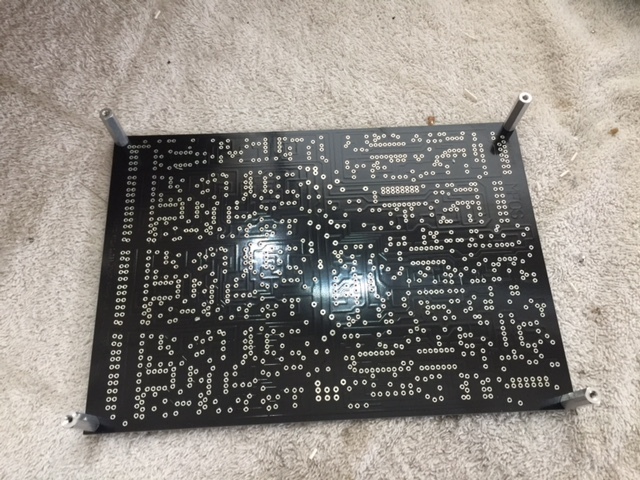 Flip the board and solder 1 leg on each. Then flip the board aging and make sure they are all nice and flat. 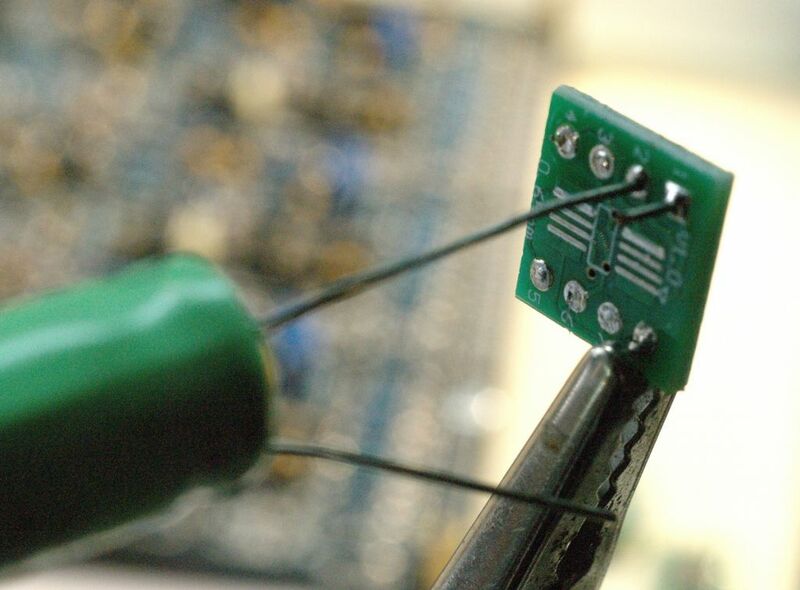 Any that aren't just heat up the solder while pressing the socket into place. Of the .1uf caps all but 5 are decoupling caps,they can be XR5 or XR7-no need for nice caps there. I installed the C58 decoupling cap and then did the kludge. The other 5 are C42,C43,C48,C61,C93. I used film for those. The rest of the caps you can use what you want, I suggest C0G for any ceramics you use. I use ceramics up to 100 pf and film for the larger values. I use styrene for C60 and C7,C17,and C29. Don't install those until you have washed your board for the final time. Next do your transistors. Jameco has the MPF102. I couldn't find PN4391.Mouser has 2N4391 which should work but with a different pin out. Check the data sheet to find the correct orientation. I'll post pics when I get mine. Once you have the trannys soldered you can wash the PCB. I use denatured alcohol and a fingernail brush,scrub hard,add some soap,scrub and then rinse while still scrubbing to make sure all soap traces are gone. 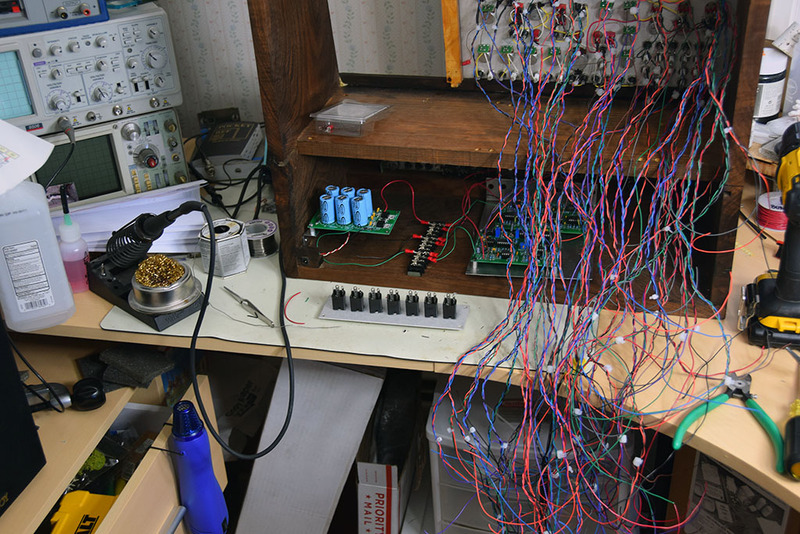 Now make a list of all missing parts,including trimmers and chips plus all the pots,switches,pots,and LEDs on the panel and put in your mouser order.. 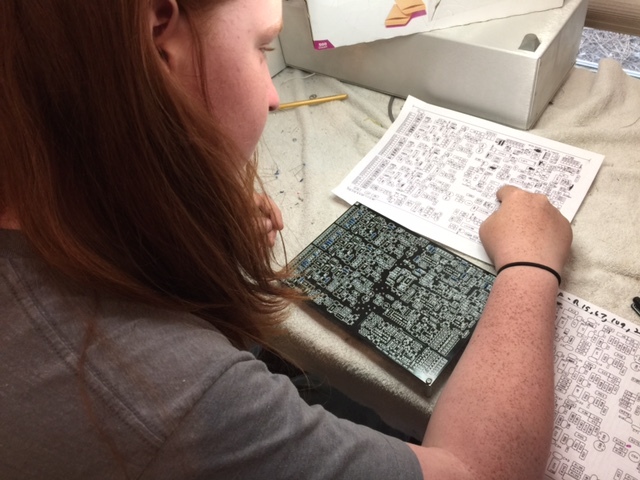 If you have panel components on hand you can start on that,or take a few days off as you wait for parts. 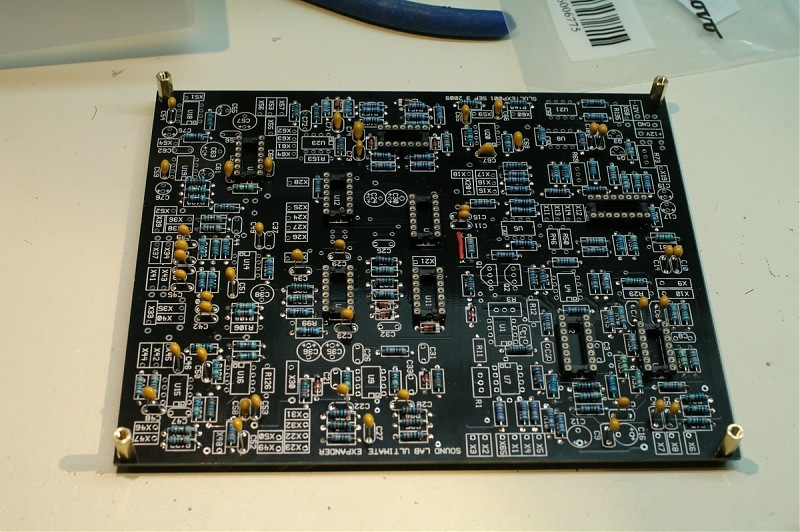 While awaiting parts I've stuffed the Ultimate Expander board. Not too much to note. 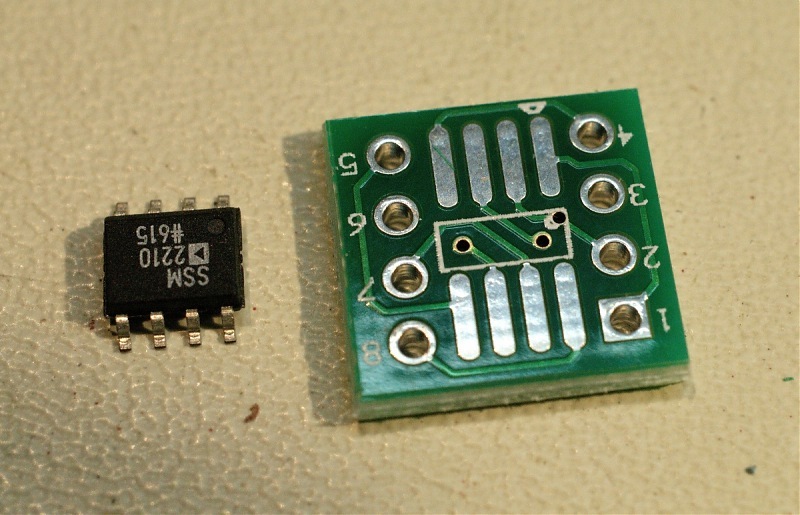 The AD633 is available from Jameco,along with the LM386 and also they have the MPF102 you need for the other board. Of the forty-three .1uf caps 26 are bypass caps,the other 17 I am using film. 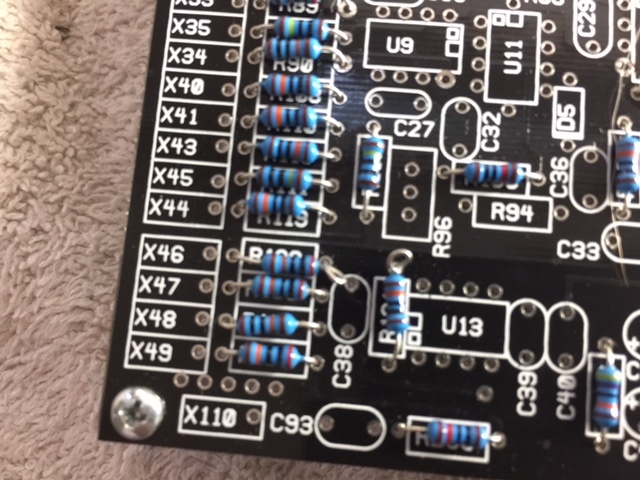 Your ultimate board should have 6 resistor spaces empty as mentioned,the expander should be short just one-R11 (assuming you are using a tempco). 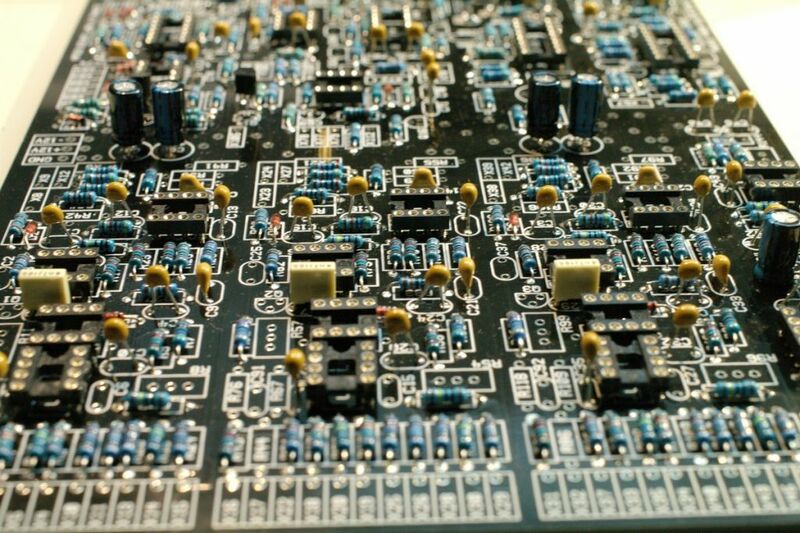 Wash your pcbs and allow time to dry. 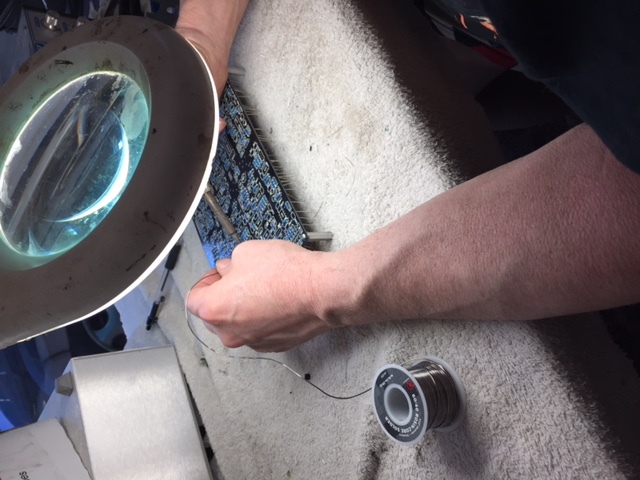 Then install the remaining components that need soldered. I install the chips after I do wiring. Inspect your work closely with a magnifying lens. You have not inspected your board if you did not use magnification to do so. Double check orientation of your diodes and chip sockets. The next step is building up the panel. I start with the pots. Print out a panel wiring guide from the MFOS site. Read what Ray had to say. I made a few mods to my panels. I drilled out the LED holes to fit the LED holder/lenses I use. I also replace all 6 attenuator pot (both panels) with attenuvertor chicklets from Low-Gain Electronics. The holes need enlarged for those. A file will do it,I used a step drill. 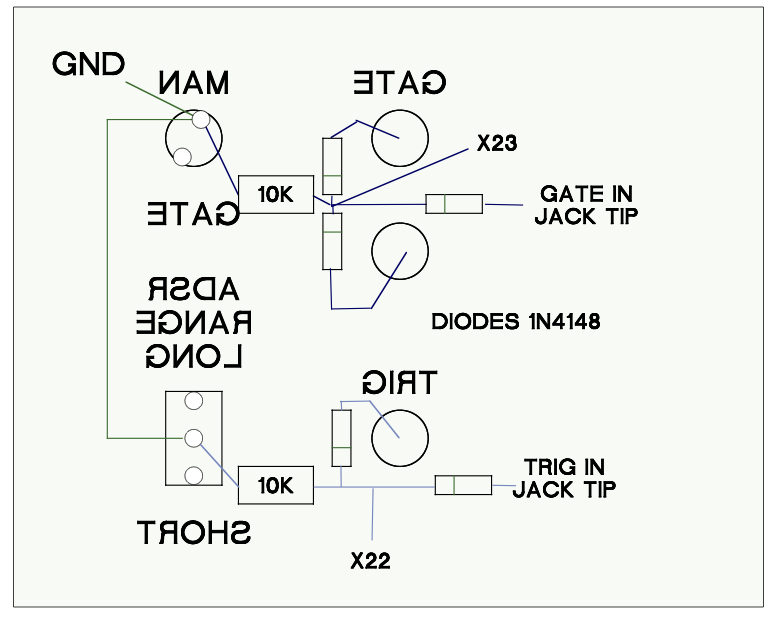 I'm also adding a passive OR gate to the gate and trigger inputs for the ADSR on the expander. I'll draw that up and post pics also. This is how it's going to be like - the wood needs to be painted, of course. Relatively dark blue in this case. It is approximately the same size as the TTSH. 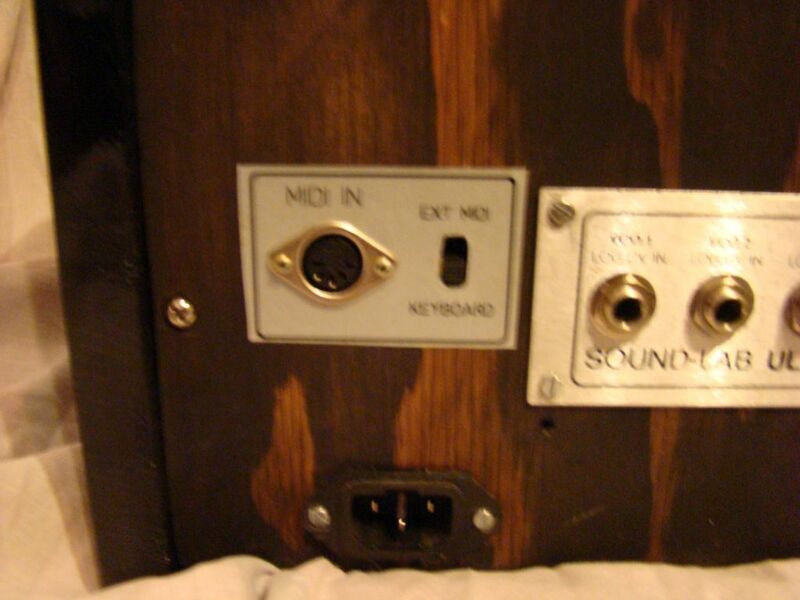 And the extra panel in the bottom center is just an jack adapter panel, like this. This will make it easier to connect 1/4 inch and 3.5 mm plugs. And there's one *aaaaargh* - about 30 pots have longer shafts than the others, which I wasn't aware of when ordering them . So I guess I'll carefully shorten them so it will look nice without the knobs (the same ones as in my avatar pic) standing out too much. 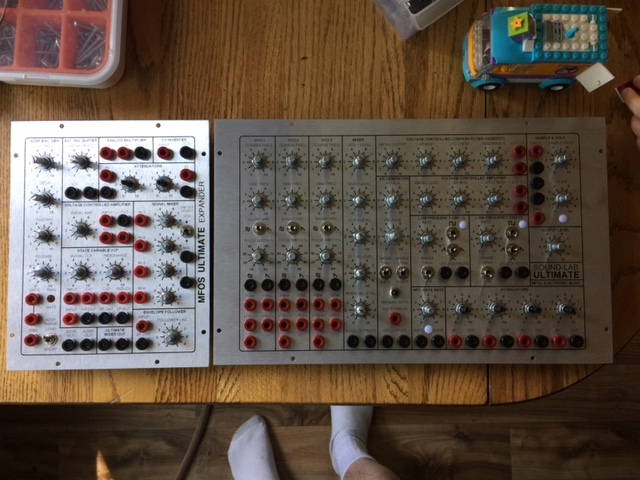 Can't be much worse than preparing the 120 (or so) switch legs for the ARP 1601 sequencer clone . 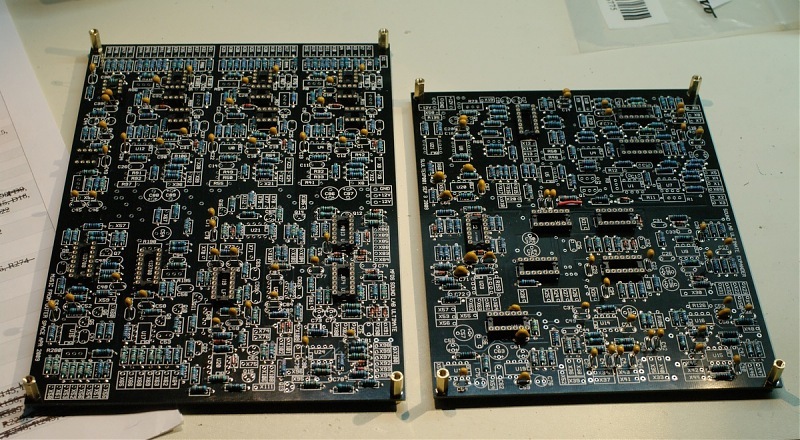 The PCBs are now almost complete, I only need to insert the ICs in their sockets and add the tempcos. Where did you get and what brand are those banana jacks? And yes bummer about the pot shafts,now I wish I had used the 13mm alphas I had in stock. Unfortunatly one of my slaves got a full time summer job and the other broke his arm 2 days before the start of summer break so my labor pool has dwindled significantly. Thanks . The overall case shape as such will be similar to that of the TTSH. I asked them if they could send only red and blue ones, which turned out to be no problem at all. As far as I can tell, the quality of these jacks is really good .